Anti-sweat injections are administered to treat and control axillary hyperhidrosis (excessive sweating of the armpits). Our price for anti-sweat injections is $580. As long as you meet the Medicare rebate criteria for this treatment (see below) you will be entitled to a rebate of $209.70. We can submit your Medicare claim at the time of payment and usually the Medicare rebate is issued to you overnight. 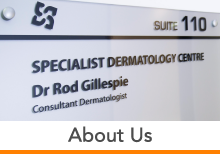 Our price for anti-sweat injections is around one third the cost of what you could expect to pay at a cosmetic clinic. 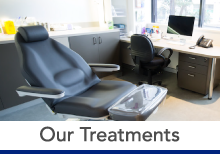 This is because we are Medicare approved and the treatment is administered as a medical procedure rather than a cosmetic procedure. Medicare rebates are available when clinical strength antiperspirants fail and when the treatment is administered by a Medicare approved injection specialist. Anti-sweat injections work by temporarily blocking the chemical signals from the nerves that stimulate sweating. Stopping these signals, stops the sweating. Anti-sweat injections are temporary. We also offer miraDry, a lasting solution for excessive underarm sweating. 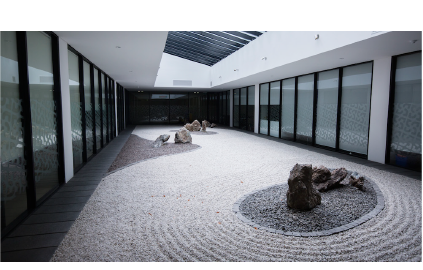 Read more about miraDry. You will be given the option of having a numbing cream applied to the treatment areas 30 minutes before the treatment takes place. The area will be marked out for treatment. 10 to 20 injections will be administered per armpit. After the injections are administered icepacks will be applied to the area for 5 minutes. Typically you will be able to return to work and normal activities straight away. Most patients begin to notice reduction of excessive sweating within 8 – 14 days. The injections are considered tolerable. 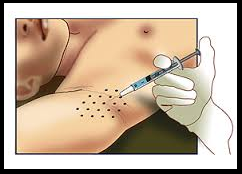 The injection needle itself is very small, however you will need to tolerate 10 to 20 injections per underarm. For this reason we do offer you the option of having a numbing cream applied 30 minutes before the treatment is administered. The numbing cream is effective in eliminating the pain associated with each injection. Anti-sweat injections are proven to be safe. The treatment has been approved by Medicare in Australia since June 2012 (pregnant women excluded). This treatment gives a temporary result. 3 or 4 treatments per year is a common patient treatment plan. Typically the effectiveness of anti-sweat injections can last between 3-6 months before another treatment is needed to maintain results. Be over the age of 12 and not pregnant. You must have tried using a clinical strength antiperspirant (eg. Driclor – available at most chemists) for 1-2 months and this has proven unsuccessful in reducing excessive sweating or has not been tolerated. If you are meet the above eligibility criteria you will be entitled to a Medicare rebate towards the cost of anti-sweat injections 3 times per year with a 4 month gap between each treatment. You will need to obtain a referral from your GP to access Medicare rebates for consultation and treatment costs for anti-sweat injections. Be sure that you have read and met the Medicare eligibility criteria listed above. 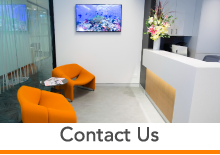 When you have obtained your GP referral please contact us to book an appointment. 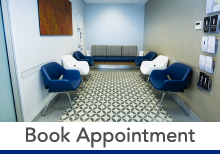 Appointment availability is usually between 1 week to 1 month. Anti-sweat injections are a medical treatment that can be life changing for a patient with axillary hyperhidrosis. This condition can affect many aspects of a patient’s life, such as social behaviour, choice of clothing, self confidence and personal comfort. Having this condition treated effectively can restore a patient’s confidence and improve their quality of life.